← Cape Breton/Irish Jam tonight! YOU ARE READING IT HERE FIRST! HI folks: We are happy to announce not only that we ARE holding World Fiddle Day 2019 event (rumours of our demise greatly exaggerated), but also that it will be a special year devoted to exploring the klezmer tradition, in partnership with the Askenaz Foundation and supported by Polyphonic Ground. Many things fell into place to enable this to happen this year, and we will be working hard to update all the Website pages in the next few days. MEANWHILE, two things you need to know immediately! 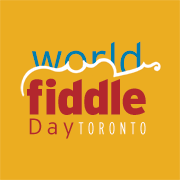 WORLD FIDDLE DAY Toronto 2019 is happening on SUNDAY, May 19, from 9:30 – 6:30, (rather than Saturday, in order to avoid the Jewish sabbath), at the Canadian Language Museum on the Glendon Campus, right beside the beautiful rose garden, at Lawrence and Bayview. Watch main page for details, but it’s easy to get to on transit, there’s parking and it’s a beautiful place to spend the day. Our guests, leading us in a day-long Klezmer Orchestra, are re-knowned duo Deborah Strauss and Jeff Warschauer, who will be coming from Pennsylvania to join us (INFO on Jeff/Deborah HERE). We will have info on registration soon. Meanwhile, WORKSHOPS at Long&Mcquade’s (Clinic space, 935 Bloor St. West) are starting on March 31 (note date correction) followed by further dates: April 14, 28 and May 12, same time, same space. So, just the four Sunday afternoons, 1:30 – 4 pm, a chance to get your feet wet in the basics of klezmer music and learn a few simple rhythms and tunes that we can play in our final concert on the day. These workshops will be led by Anne Lederman and Martin Van de Ven. Suggested donation $20, Seniors/Students/Under-employed $10 9 (please speak to us if it’s an issue). Please join us. World Fiddle Day yaay! So happy that this is happening ! Lovely, look forward to seeing you. .